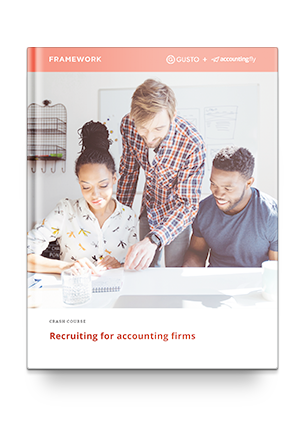 Recruiting for your accounting firm can be a tricky endeavor. We get it, which is why Accountingfly and Gusto teamed up to create this comprehensive guide. From culture and on boarding, to sourcing strategies that get results, this guide will teach you how to build an effective and thoughtful recruiting strategy that will draw amazing people to your firm. You’ll also find useful checklists, templates, case studies, and expert advice that will make the entire process easy and impactful.